“Then would you please explain what a cow looks like?” the disciple requested. The Master explained: “A cow has four legs, It does not live in the forest. Its a domestic animal, one can find it in the villages. 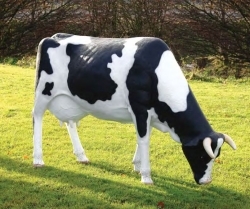 It gives milk, a liquid white in color, which is good for health.” His Master gave him a lot more information on the features of a cow: the eyes, ears, legs, stomach, udder, horns. The disciple went to a village, where he saw a statue of a cow.Someone was who was painting an adjacent compound wall with chalk, had left a bucket full of lime water near the statue of the cow.The disciple saw the cow, carefully observed its features, came to the conclusion that it must be the cow.He also saw a bucket with white liquid near by. ‘This is definitely a cow, so this must be the milk’ thought the disciple and drank some of it. He soon started screaming with pain, had to be hospitalized. “Master you don’t know anything about the cows or the milk, you are totally wrong.” the disciple answered. “Tell me what happened.” The Master sought an explanation. The disciple explained everything. “Did you milk the cow yourself?” asked the Guru. “That’s why you are in trouble. If you rely on what others say, you won’t get to the truth which will liberate you.” te Wise Master replied. One has to experience and not merely learn and follow others blindly. Experience is the best teacher for acquiring material as well as spiritual knowledge.